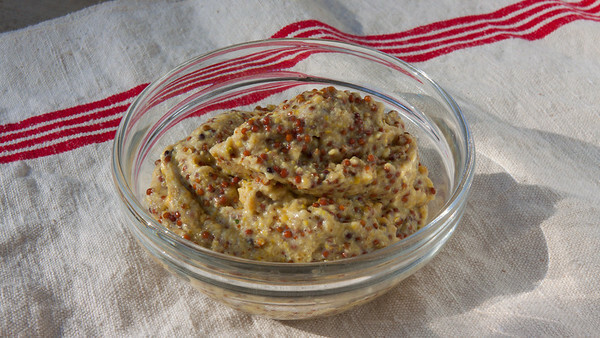 This is my first time making mustard – easier than I imagined, highly recommended. Better than store bought, and this recipe packs some punch. Perfect for me with pigs-in-a-blanket, pretzels, or a panini sandwich. More sensitive palates may need to adjust:Â bring down the spicy brown seed ratio and replace with similar yellow seed count for a recipe with a little less ‘zest’. Place seeds in medium sized bowl. Stir in cold waterÂ and wine. Cover and let stand overnight for a little fermenting. Put mustard and salt into a food processer and puree until you reach the desired consistency. Transfer to airtight container and refrigerate for 24 hours before using. Lasts a few months if kept in airtight container.